We have a new a resident at Tisarana. 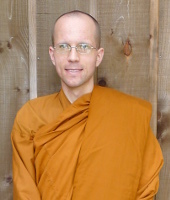 A warm welcome to Anagarika John, who has joined us from Birken monastery in B.C. His intention is to stay on to continue his training at Tisarana. You can find out more about Anagarika John on the Resident Community page on the website. Be sure to say hello the next time you stop by. Our new website up and running! The layout is basically the same as the old one, so you should be able to find your way around pretty easily. The biggest differences are on the administrative side. The website is easier to keep maintained. It is also easier for the relatively computer illiterate add photos, edit pages, etc. We’ve also added many books to the ‘Books’ page. Take a look if you haven’t already. There may very well still be some kinks in the site that we haven’t noticed. If you see anything that’s not working, or if you have any suggestions, please send us an e-mail. Sincere thanks to Tavaro in England for his help. Without his impetus, the website we have would not have been built. More computer news! Tina and Geoff Karlson have spent quite a bit of time bringing our accounting system up to date. They’ve been able to automate processes that used to be quite time consuming. The new system will make it much easier for the monastery treasurer to do their job. These kinds of improvements go a long way towards making the monastery run smoothly. Sadhu Tina and Geoff! Our old workshop is in the process of being re-modeled. The new building will be heated and well sealed to keep our tools safe. So far, the basement ceiling has been raised and a new floor and set of stairs have been put in. Take a peek the next time you come by. The work projects are winding down as the cold begins to set in. The monks are currently taking turns going on two-week self retreats. A nice prelude to our longer retreat in the winter.